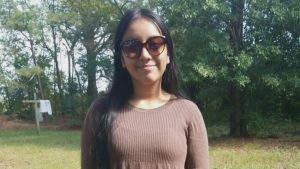 LUMBERTON, N.C. (WRAL) – The Lumberton, North Carolina community joined in prayer Wednesday night as the search continues for a kidnapped 13-year-old girl. Hania Noelia Aguilar, an eighth-grader at Lumberton Junior High School, was snatched Monday by a man dressed in black and wearing a yellow bandana while she was standing outside her family’s home. Circled in strength and surrounded by the Lumberton community, Hania’s mother begged her daughter’s kidnapper to bring her home. “I don’t know who you are, but I know you have a heart,” she said. Authorities on Wednesday said that surveillance cameras captured photos and video of the stolen SUV used in Hania’s kidnapping, which has peeling paint on the hood and a Clemson sticker on the rear window, and South Carolina license plate NWS-984.